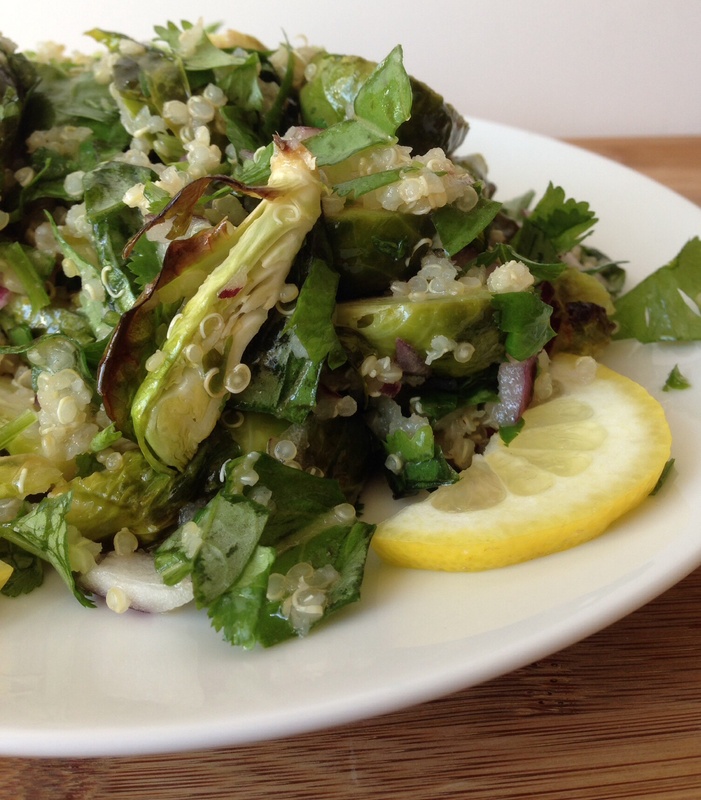 Roasted Brussels Sprout & Quinoa Salad – What's for dinner, Doc? Duke’s Beach House in Maui serves a side dish of Brussels sprouts and red quinoa which I found by accident. This inexpensive $6.00 dish is hidden in small print with the 5 Cheese Mac and Cheese, Creamed Maui Corn and Bok Choy almost as an after thought. But I swear it is my favorite dish on the menu. I always look for an interesting vegetable dish to add to my meal or to eat as my main meal. I always share a few bites with my man so I can mooch some protein off of his plate. $6.00 is considered almost free in Hawaii so it’s a bargain and it’s packed with vegetarian goodness. Here is my re-creation of Duke’s dish with more Brussels sprouts and fresh herbs, having no idea what they use in their dish besides quinoa and Brussels sprouts. Recipe Or stop by TinnedTomatoes.com for great vegetarian and vegan recipes here. I need a recipe plug in. Any suggestions? Olive oil, or nut oil 1/4 cup, divided. I used roasted walnut oil from Trader Joe’s. For more protein toss in toasted walnuts, feta cheese, chicken or fish. 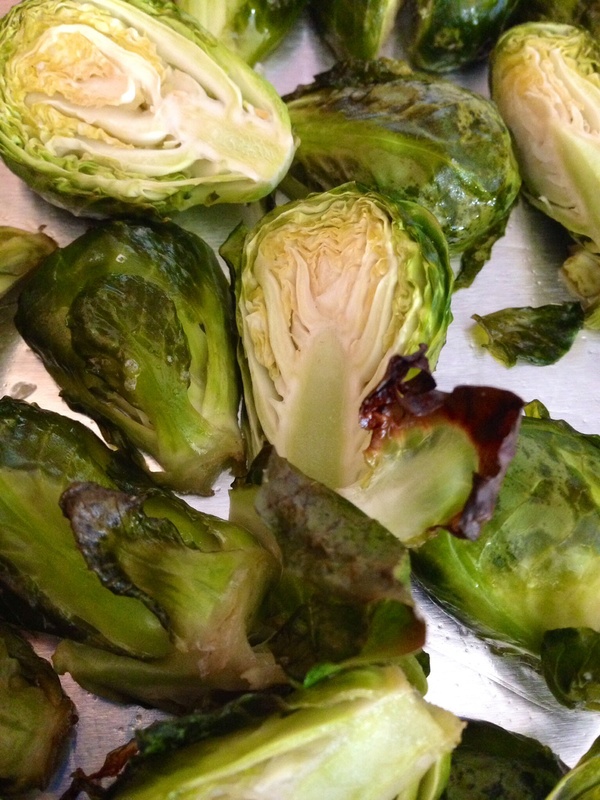 Place Brussels sprouts on a baking sheet with a drizzle of olive oil and bake 15-25 minutes until crisp tender and slightly charred. Allow to cool. Rinse quinoa thoroughly in a strainer. Add to water or broth, bring to a boil and then simmer for 20 minutes. Let cool. 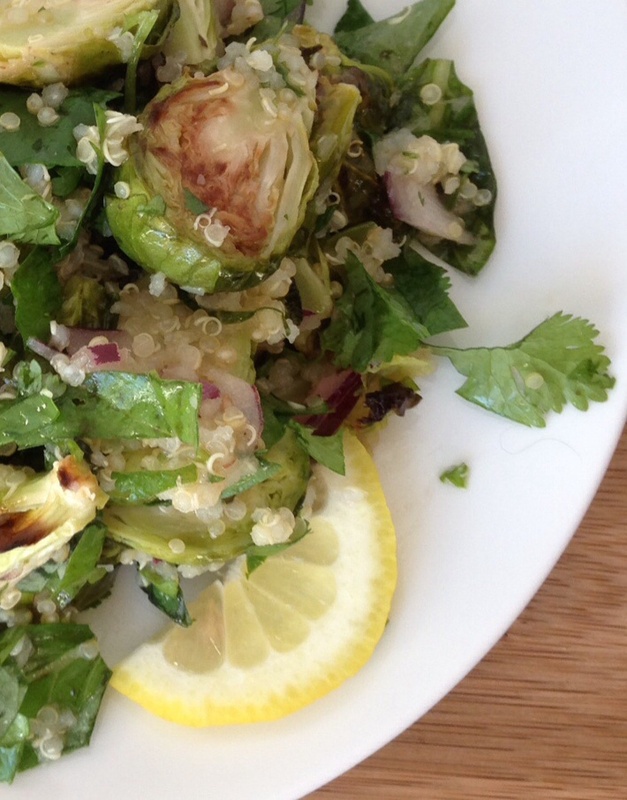 Combine sprouts, quinoa, chopped herbs, and onions. 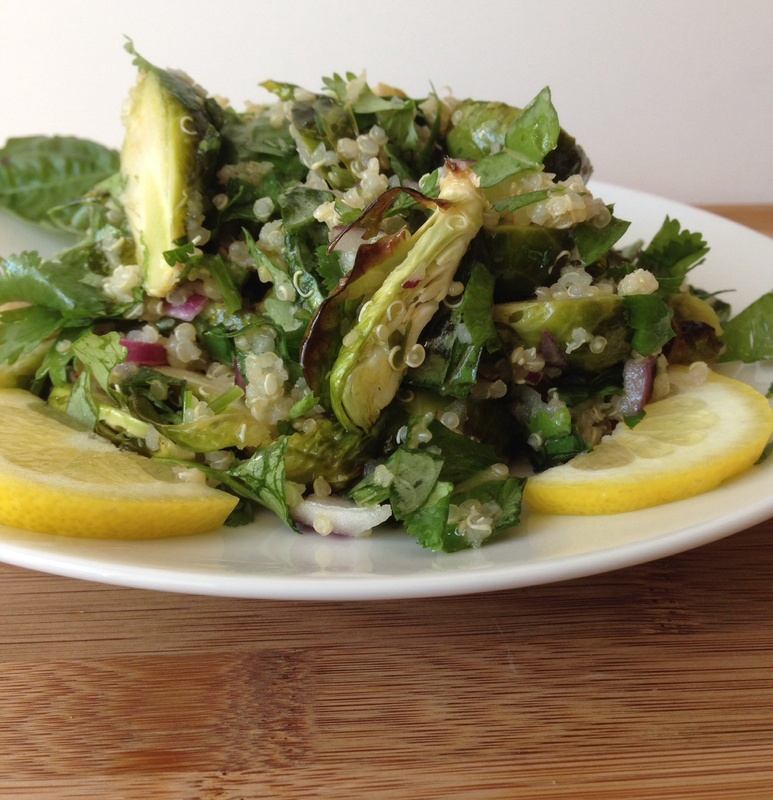 Squeeze juice of 1 lemon and remaining olive oil over salad and toss to combine. Taste, adjust tartness and add salt and pepper to taste. Love this recipe! So glad you shared it. Thank you. Sounds like a great recipe! Looks yummy! Sounds so good, best of all, simple, just the way I like my cooking! Looks very healthy and yum! 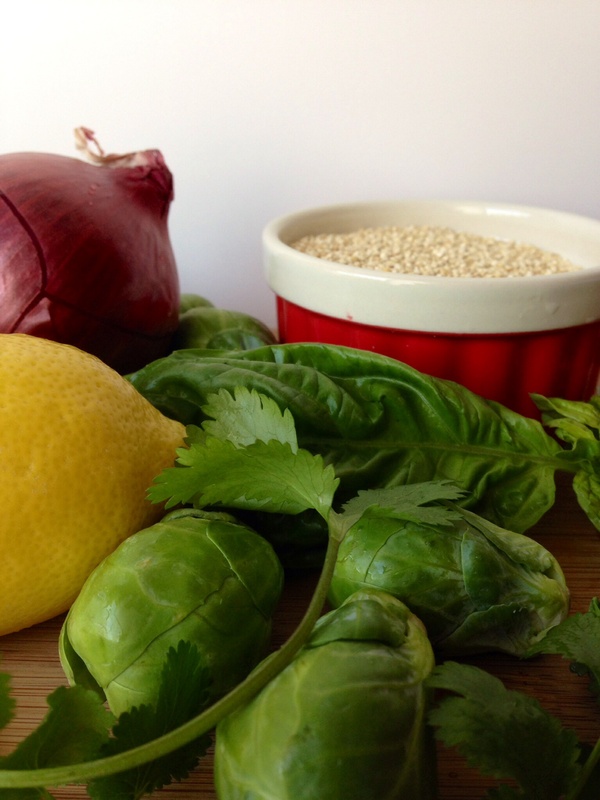 I tried a similar recipe concept that tured out well… where the quinoa was tossed in store-bought basil pesto along with the sauteed onions/vegs – with a dash of lemon. I never lose sight of my Fiesta Friday Foodies. Thank you for commenting. Your salad looks so light and tasty! Thanks for sharing it with FF#65. And Angie is right, all you need is the shortcodes listed in the link above. They’re pretty easy to add and their look depends on your theme. Good luck with it! Thank you Angie and Elamb. The recipe code works! Looks so lovely and fresh, especially with all those fresh herbs you used! Oh, and the recipe code looks useful! I may try that; at the moment I’ve just been putting recipes in plain text as well. I was an easy fix for the free WordPress since I couldn’t use a plug in.